Life is sweeter with cherries, and it appears to be healthier too. They appear to reduce risk of diseases like cancer, to reduce hypertension and harmful inflammation, and to relieve sleepless nights and muscle aches. Cherries are the perfect addition to your diet! But like most good things in life, if you don’t take advantage of the season, you might miss your opportunity. Cherries aren’t around for long – unlike most produce we see in the store all year round, cherries are there one day and gone the next. Sweet cherries contain most of their phytonutrients from deep red and purple colors. They are called anthocyanins, phytonutrients that appear to help prevent cancerous cells from growing. One cup of cherries has the same amount of potassium as a banana, which helps keep potassium and sodium in balance in order to prevent high blood pressure. 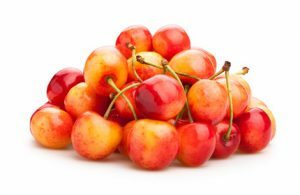 Also, these sweet cherries contain a phytonutrient, quercetin, that may keep hypertension in check by relaxing blood vessels and keeping them supple. Excess uric acid in the blood can cause excruciating pain, swelling, tenderness, and inflammation with both arthritis and gout. A growing body of research indicates that both sweet and tart cherries can help. A study done by the USDA found that eating 2 cups of Bing cherries can reduce uric acid by as much as 15 percent, as well as the marker for harmful chronic inflammation. Tart cherries contain melatonin, a hormone that helps you to feel sleepy at night. Sunlight destroys the melatonin during the day, so don’t worry about cherries making you tired during the day. Two tablespoons of tart cherry juice have been shown in studies to help study participants sleep more soundly. The melatonin in tart cherry juice is very well absorbed, so pour yourself a little cherry juice nightcap for a natural sleep aid. Tart cherry juice may even decrease muscle soreness after a workout. The runners in one study published in the International Society of Sports Nutrition drank 24 ounces of tart cherry juice for seven days before a long distance race and on the day of the race.  These runners experienced fewer aches after the race than did the runners drinking a placebo. While a recommended daily dosage has yet to be established, studies indicate it’s possible that eating 1.5 cups of tart cherries or drinking 1 cup of tart cherry juice per day could be enough to decrease muscles soreness. Cherries are not only healthy, they are also delicious and versatile. They can be added to everything from pasta to pork, and they can be eaten raw, roasted, or cooked down to make a sauce, or strained for juice. Or, just serve this luscious whole food by the bowlful for dessert. 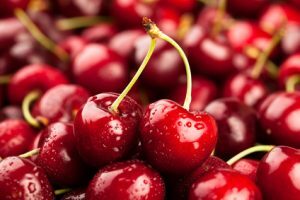 Take June’s Healthy Challenge and eat cherries before the season ends to add sweetness to your life, and many health benefits. Maybe life is just a bowl of cherries, and a bowl of cherries may help you feel much better! A square of 70% or higher dark chocolate here and there will satisfy your cravings and provide you with amazing health benefits. Use cocoa powder in your cooking and baking too! Americans' love affair with potatoes has added to our weight problems, but purple potatoes may be the super spud we need to negate the downside of white potatoes while improving our health. No matter their size or shape, purple potatoes have royal benefits. I know that sorghum probably isn't the kind of meal you were planning on having for dinner tonight, but FYI, it's the next quinoa, so keep your eyes, ears, and mouth open to it. Some of you gluten-free readers already know it in its ground flour form, but it's also available as a grain that looks similar to pearled couscous once cooked. It's a tasty, nutrient-loaded, whole-grain, gluten-free swap for rice and quinoa that rivals the most nutritious foods. Unlike quinoa, it's easily grown in the US, even in drought conditions, so this nutritious ancient grain is inexpensive and as it becomes increasingly popular, it will be easy to access.